The life of Apollonius of Tyana has been virtually forgotten. Although much about him is lost, some of his correspondence remains, along with the notes and diaries of his disciple, Damis of Nineveh. Julia Domna, an eager student of philosophy and wife of the Roman Emperor Septimius Severus (193-211 AD), deserves much of the credit for preserving this material. It was she who asked Flavius Philostratus, Greek scholar and author, to restyle the correspondence, preserved by the Emperor Hadrian in Egypt, and the texts she had received from a descendant of Damis' family, into a single piece of literature. 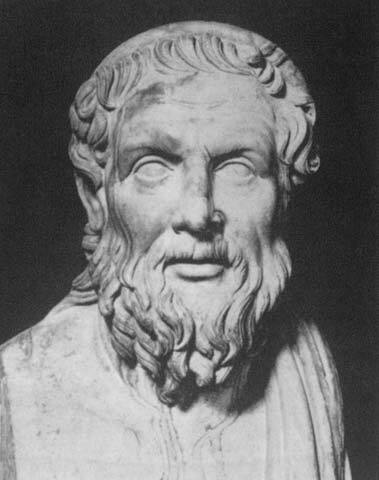 Based on these resources and his travels in the footsteps of Apollonius, Philostratus wrote an influential biography about a hundred years after the sage's presumed death. the prophetic old man of the sea, a subject or son of Poseidon. . . . According to legend, he rose from the sea at midday and slept in the shade of the rocks, with sea monsters round him; anyone wishing to consult him must try to seize him at that time. To avoid prophesying, he assumed all sorts of dreadful shapes; if however he saw that his efforts were unavailing, he resumed his usual shape and gave his response. . . .
As with the stories of Jesus and Buddha, the birth of Apollonius has been embellished with mythic events. According to legend, after his mother fell asleep in a meadow, swans encircled her and began to cry at the moment supreme. A bolt of lightning fell from the sky and withdrew. The swans may be equivalent to the Sanskrit bird hamsa, symbolizing the identity of the human with the divine essence. The thunderbolt might reflect the great cosmic power that ushered in the incarnation of a long-awaited messenger. As a youth Apollonius joined the temple of Aesculapius at Aegae -- what we might call a hospital -- where he studied healing, saying later: "Pythagoras said that the most divine art was that of healing. And if the healing art is most divine, it must occupy itself with the soul as well as with the body; for no creature can be sound so long as the higher part in it is sickly." (G. R. S. Mead, Apollonius of Tyana, The Philosopher-Explorer and Social Reformer of the First Century A.D., p. 148.) After his elementary training ended and his father died, Apollonius distributed his inheritance and became a philosopher. His teacher once asked him "why so noble a thinker as he and one who was master of a diction so fine and sensitive did not write a book," and he replied: "I have not yet kept silence." From then on he did not say a word for five years, travelling through Pamphilia and Silicia working for the betterment of the people. Afterwards he set out for India to find the sages who lived there. Apollonius later survived a dangerous meeting with the Emperor Domitian. Domitian was very anxious to remain in power and his courts were filled with agents who reported any activities that could endanger his rule. The sage had spoken publicly to a statue of the Emperor, saying: "Thou fool, how little thou understandest the decrees of Fate and Necessity [karma]. For he whom they appoint to reign will reign; though he should be put to death by you, he will again come to life to fulfill their laws." (P. A. Malpas, True Messiah: The Story and Wisdom of Apollonius of Tyana 3 BC-AD 96, pp. 133-4) Domitian was determined to execute Apollonius, but according to Roman law could do so only after an official tribunal. When he ordered Apollonius' arrest, the sage knew it immediately and decided to go to Rome of his own accord. He told his companions his resolve, and their courage was tested in the fire. He made it clear that he who lives to please the gods has nothing to fear, so why not go into the lion's den? To the amazement of many, he appeared in Rome within ten days. "Tomorrow, if it depended on the judge. But if it depended on me, this very minute!" So saying, he drew his leg out of its heavy fetters and said: "You see how free I am! So cheer up!" . . . The next day, Apollonius called Damis and told him to go to Puteoli and salute Demetrius. "Better walk instead of going by boat . . . you will find it the best way of traveling. Then when you have seen Demetrius, go down to the shore by Calypso's Isle and you will see me." . . .
Oh, the crime of being unfashionable, the turpitude of an old suit, the iniquity of a last year's frock! Because the earth which supplies me with food, supplies me also with raiment, and by wearing garments derived from it, I offer no injury to miserable animals. Because every good man is entitled to be so called! By living on a lighter diet than other men, O Emperor, I was the first to see its approach. "Apollonius, tell me on whose account you sacrificed a boy on the day you left your house and went into the country?" . . .
Apollonius spoke as to a naughty little child: "Speak nicely, please. If it can be proved I left the house on the day named, I will grant my being in the country and offering the sacrifice in question; more than that, if I did so sacrifice, I will allow that I committed the atrocity of eating the flesh on that occasion. Now while I admit this, I shall demand that persons both of credit and character substantiate the fact." He then vanished from the court and reappeared immediately in Puteoli, three days from Rome, to meet with Damis and Demetrius. Clearly he had not been bodily present at the tribunal. There is no death of anyone, but only in appearance, even as there is no birth of any, save only in seeming. The change from being to becoming seems to be birth, and the change from becoming to being seems to be death, but in reality no one is ever born, nor does one ever die. It is simply a being visible and then invisible; the former through the density of matter, and the latter because of the subtlety of being -- being which is ever the same, its only change being motion and rest. For being has this necessary peculiarity, that its change is brought about by nothing external to itself; but whole becomes parts and parts become whole in the oneness of the all. . . .
Apollonius resented hypocrisy, idolatry, and all abuse of power. The story Damis wrote under the supervision of his master, later reworked by Philostratus, is also a Mystery-story of training, quest, and initiation, full of charity, wise sayings, and miracles. No wonder the early authorities of the Christian Church put so much effort into deriding his story. The life of the enigmatic Apollonius must have been disturbing to them, particularly as they wished the Church to have a monopoly on miracles. A vicious treatise by Bishop Eusebius of Caesarea, written in the early fourth century AD, effectively discredited Apollonius. There is much authentic historical material on Apollonius, however, who unlike Jesus is mentioned by contemporary emperors, officials, and philosophers. Let us then remember and share the great achievements of Apollonius of Tyana so that perhaps one day we may become as capable and worthy as he.